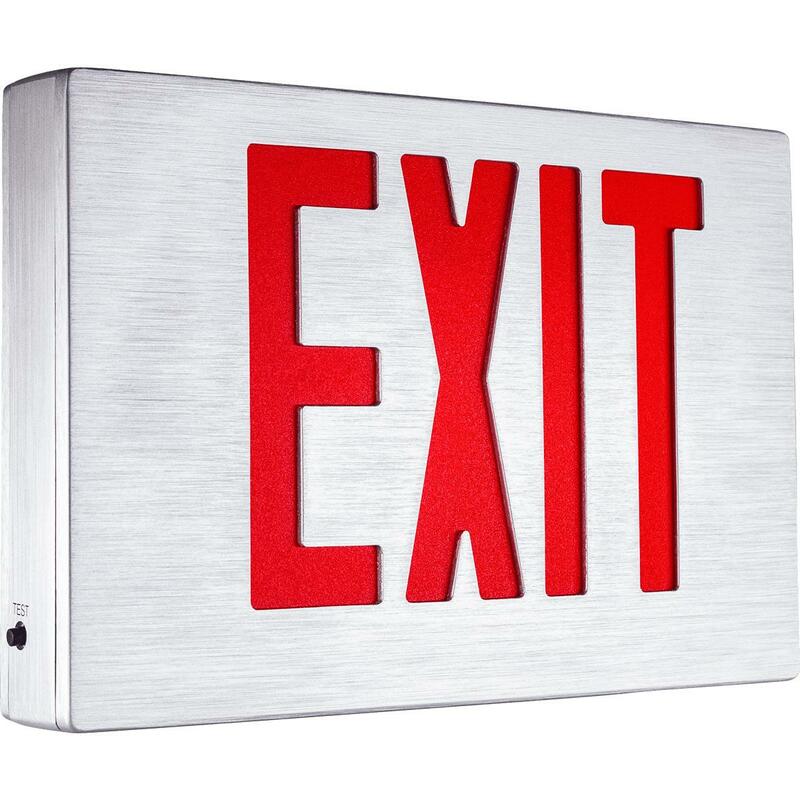 The Alumaxus Die-Cast Aluminum Exit Sign Featuring a Modern Curved Face Plate With Brushed Aluminum Accents. Universal installation design, the same single unit works with top, side, or back mounting, as well, single or double faced with all arrow configurations decided in-field. Brilliant Red or Green LEDs are positioned within the sign body cavity to ensure clear and even illumination across the full EXIT legend. The LEDs use less than 5 watts electricity and are efficient enough to remain illuminated using the on-board battery (EM version) for periods longer than 90 minutes. The universal mounting bracket makes connection to junction boxes quick and simple for top and side installations. The mounting bracket provides the means for the electrical wires to channel through to the electricity source. The back plate contains patterns for easy alignment connectivity for back mounting, simply use the knock out patterns to receive the electrical wires and the key slot pattern for connecting the two screws which are provided along with the needed wire connectors. The Alumaxus features a curved aluminum face plate which is available in a brushed clear finish, powder coated white, or black. The housing is die-casted premium grade aluminum and is naturally impact-resistant. The unit is available with tamper-proof screws making this model an attractive, yet functional vandal-resistant option. 5 years prorated for the battery. UL Listed for damp locations (0°C – 50°C). Meets UL924, NFPA 101 Life Safety Code, NEC, OSHA, Local and State Codes. The Alumaxus is UL Listed for damp locations (0°C – 50°C). The sign mounts to junction boxes via the side or top configuration using the supplied mounting bracket. For back mounting, the back plate contains the needed grid for alignment and conduit knock outs. The mounting, face count, and arrow configuration can be decided at the time of installation. A single housing chasis is capable of supporting single or double face installations. The face plates contain perforated indentations on the inner side allowing for the chevrons to be configured at the time of installation. The side and top mounting connectors are indistinguishable while not in use and are easily removed for either configuration. The face plates and back plate snap lock in place. There a push to test button easily accessible when the unit is installed. The SDT version features legible indicators without requiring the unit to be opened or closely inspected. Indoor dry or damp locations with temperature ranges between 0C-50C or 32F-122F that would benefit from Alumaxus' enhanced durability and the brushed aluminum design aesthetic. A strip of brilliant energy-efficient red or green LEDs evenly illuminate the signs EXIT legend. The die-cast aluminum housing offers superior durability and design. The brushed finished features long strokes across the curved face which aesthetically complement other types of metals and lighting hues that may be present at the installation location.